This is part of our ongoing series called The Local View – travel writers on their home towns. We often overlook the places that are closest or most familiar to us, but here travel writers share their local pride. 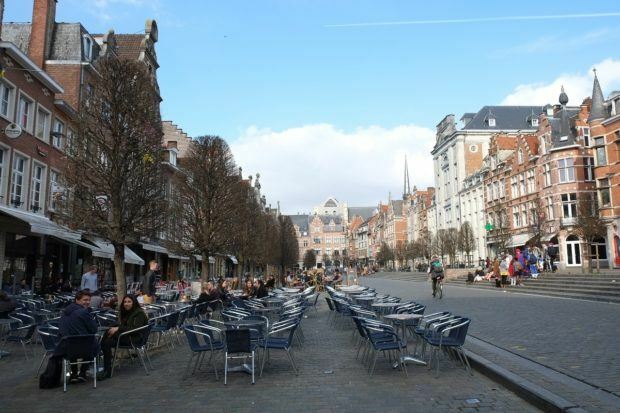 This article on things to do in Leuven, Belgium comes from Sofie Couwenbergh. Leuven is a small university city about 20 minutes by train from the Belgian capital Brussels. It’s located in the Dutch speaking part of the country, but walking around the city you’ll definitely hear more than one language. Not only does the university attract lots of foreign students, but the city is also home to the world renown technology company IMEC which brings in bright minds from all over the world. 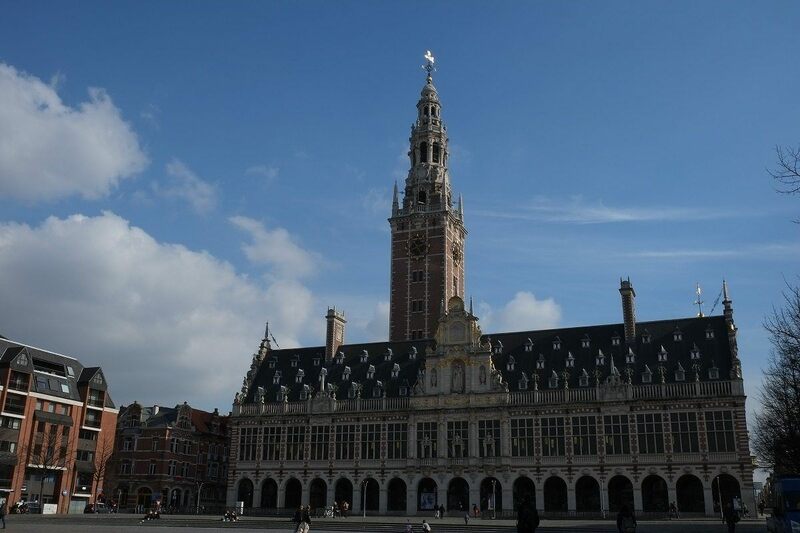 About 40,000 students attend the university of Leuven every year, which is a considerable amount if you know that the city has about 90,000 actual inhabitants. As these students usually go home for the weekend, it’s important to spend at least one weekday in Leuven to get that true Leuven vibe. But what is there to do in Leuven on a weekday? Plenty! If you’re into shopping, start your day by wandering through the Diestsestraat and the Bongenotenlaan. These are Leuven’s two main shopping street where you’ll find all the big European brands, such as H&M and Zara. However, locals know they need to pass between those two streets by taking the P.J. Van Benedenstraat to get to WEAR, a trendy local shop that often sells Belgian brands. Getting hungry? There are plenty of great food spots in Leuven, but my absolute favorite is De Werf (“The Yard”) at the Hogeschoolplein. This place has an extensive menu with salads, wraps, sandwiches and warm dishes like spaghetti and lasagna. Al dishes are served in an original way, the portions are huge and the prices are cheap. 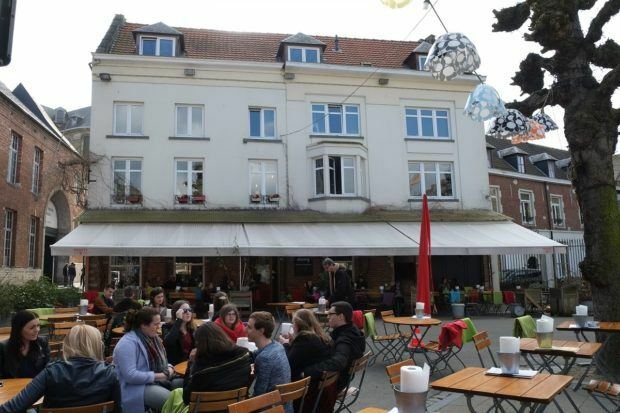 it can get a bit loud and warm inside, but De Werf has a huge terrace where you can enjoy the sunshine or crawl under a fleece blanket when it gets a little chilly. Walk off your lunch by heading to the Big Beguinage, a UNESCO World Heritage Site and a place of peace and quiet near the edge of the city. The university owns it now and rents the houses to foreign students, professors and other academics. No cars are allowed here and only the brave try to conquer the cobblestones with their bikes. 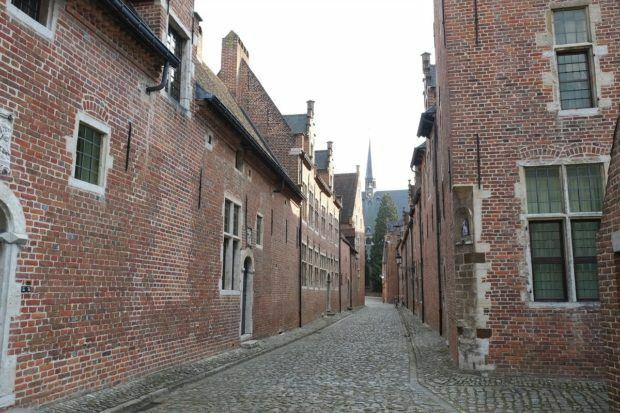 When you’re done at the Beguinage, it’s only a ten-minute walk to Leuven’s Botanical Garden. 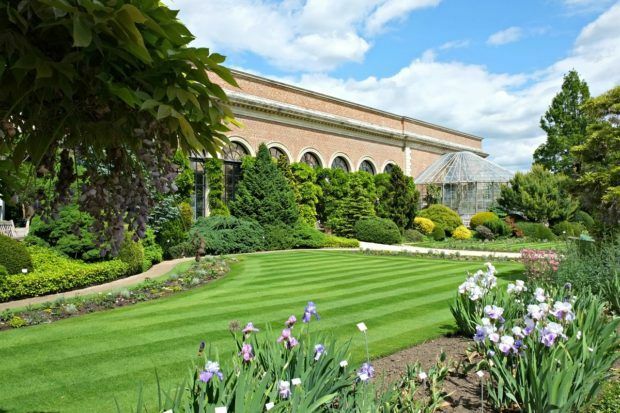 It was founded as a herb garden for the university’s medicine students, but it now showcases a wide variety of plants and flowers as well. “The Sunken Garden” is the only sport that has a few tables and you’ll often find students working here, taking advantage of the silence they might not have at their room in the city center. Next up is the Parijsstraat, a car-free cute little street with small shops and lots of foodie hotspots. Koffie Onan is the place to be for coffee and tea lovers, as they have a big wall to wall closet filled with different coffees and teas. When you order a tea, you even get to sniff some of them to decide which one you’d like. So cool! Opposite from the Parijsstraat lies the Mechelsestraat, of which the first part resembles the Parijsstraat a lot. However, it’s only when you keep following this street through the boring part where cars can come, that you’ll really be rewarded because away from the shopping center and to the right of this street lies the Small Beguinage. Yup, Leuven has two of them and this one is also a UNESCO World Heritage site. Opposite from the Beguinage, on the other side of the Mechelsestraat, you can find De Bruul park. Contrary to the St. Donatus Park, which lies in the center of the city, only locals come here. It’s not that pretty, but it has a playground which is nice if you have kids that you need to let loose for a while. You can spend the rest of your afternoon shopping, visiting the University Library at the Ladeuzeplein or marveling at art at the M Museum. However, in the evening you need to make sure you get to the Oude Markt (“Old Market”) after dinner (grad some ribs at Ribs in the Parijsstraat, or go for a wide variety of choices at Entreprise in the Naamsestraat). This is the place to grab a drink at night and do some people watching from one of the many terraces when the weather is nice. Most of the bars here will turn up the music late in the evening and stay open until sunrise to welcome partygoers. But don’t worry, if you just want to sit and enjoy a drink, that’s perfectly fine as well. I hope you enjoyed your weekday in Leuven! Do you have more time to spent in Leuven or are you interested in learning about other cool places in the city? Then check out my Leuven Guide for more tips on where to go, what to do, where to eat and where to stay when visiting the city. Sofie quit her job to forge her own career path writing and traveling. On her blog Wonderful Wanderings she shows her readers cities and local culture in Belgium and beyond. She does not function without a cup of tea in the morning and has a weakness for chocolate. You can connect with her on Facebook or Instagram. Six Magical Villages to Love in Alsace, France Ghent or Bruges — Which Belgian City is Best for You? What do you think about Experience Leuven on a Weekday? Love the brick alleyways of this town … love off the beaten track places in Europe! It’s funny how a site so known within the country can seem off the beaten track to visitors:) Glad you like the look of it!